Copper Pots, originally uploaded by Ian Wright. i've had the great luck of befriending the manager of the yuppie cookware shop next door. he knows exactly how big of a cheapskate i am. he is also aware of my love of copper cookware. even though i'm majorly cheap, i'll pay a lot for something if i know it's forever. 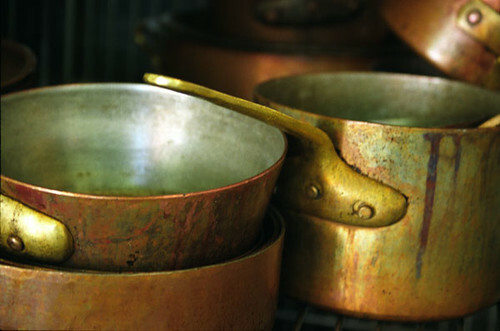 and antique copper cookware is by definition forever. so is the heavy duty cast-iron handled mauviel stuff. that's why those two are the only ones i'd buy. still, there's expensive, and then there's expensive. that's where my friend comes in. he flagged me down today in the parking lot to tell me that someone had returned a mauviel pot because of a scratch. a scratch that was invisible to him, and me. and then he sold me the pot for 55% off. this is the second time this has happened. i'm collecting a little army.